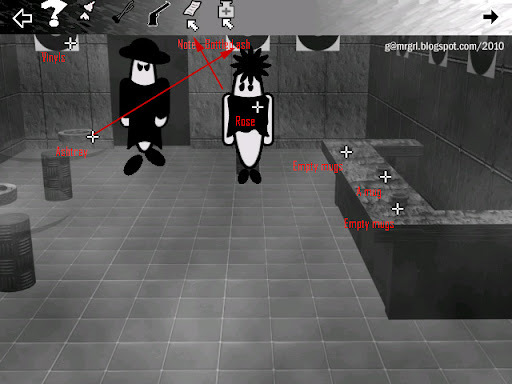 The '+' sign crosshairs are the cursor for this game. Left click on a hotspot to have Keith state what is of interest about it. Right click to interact with a hotspot. 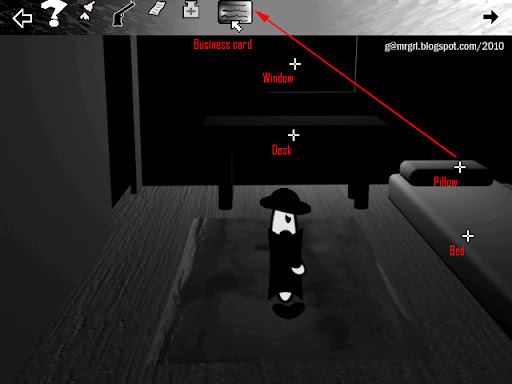 Roll over the top part of the screen to access the Help and the Inventory. Objects collected by Keith are placed in the inventory. 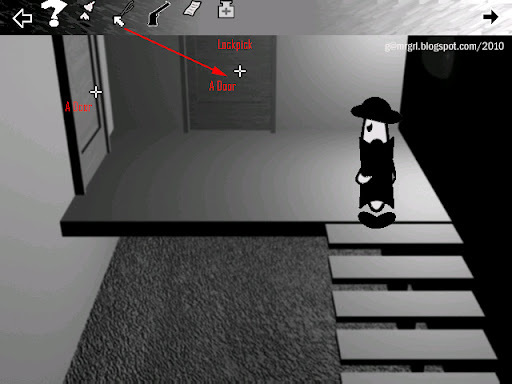 Right click an object in the inventory to 'pick' it up. 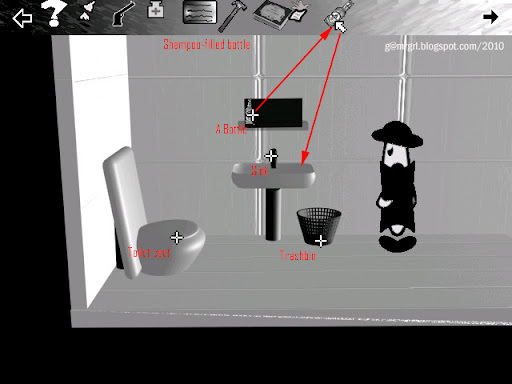 The cursor changes to the image of the item in the 'play area'. Drag the item to the destination object and click on it to use together. Once any object expends its use, it is discarded from the inventory. Keith travels via an interactive map. Accessible locations are highlighted in white on the map. Left click the location where Keith has to travel. Press F5 to save and F7 to load games. Press CTRL Q to exit the game. The game starts on the forest road where Keith has been abandoned. Click the bushes at the bottom of the screen. 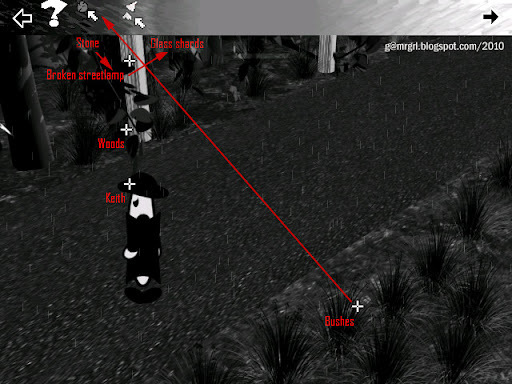 Right click the bushes to pick up a stone. Click the broken streetlamp - the pillar on the left. Right click the stone. Left click on the broken streetlamp. Collect the glass shards on the road. Exit the scene at bottom left. A map is revealed. 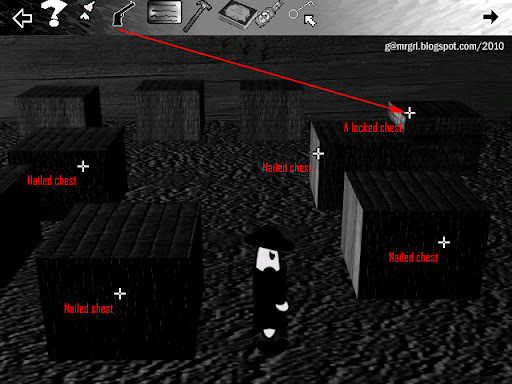 Roll the cursor over the map to reveal the accessible locations. In this case, Keith is in the woods at top left. Left click to go to the office at top right. The office has been broken into and ransacked. Click the topshelf of the bookshelf. A pistol is added to the inventory. It has only one bullet. Click the table to collect Keith's lockpick. Click the files in the bookshelf. Keith has been investigating the murder of his friend, Walter Stillman. Exit the office at bottom right. Click Rose's at the top middle of the map. Click the mug in the middle of the bar counter. Keith needs something to carry the beer. Click the ashtray on the table at rear left. Keith needs something to carry the ash. Click all dialog options to learn more about the case and Rose's work. A note is added to the inventory. It has Stillman's address and is made of flammable paper. 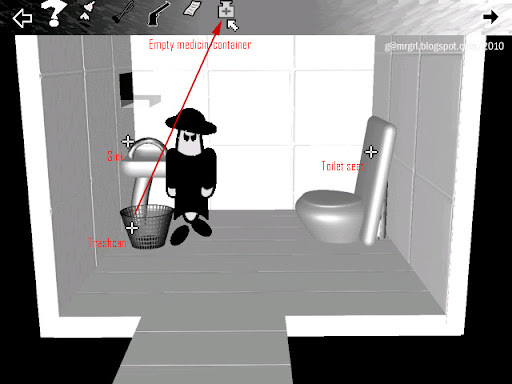 Click the door in the rear wall to enter the bathroom. Click the trashcan beside the sink. A medicine container is added to the inventory. Click the medicine container in the inventory. Click the ashtray. Bottled ash is added to the inventory. Exit the bar at bottom right. 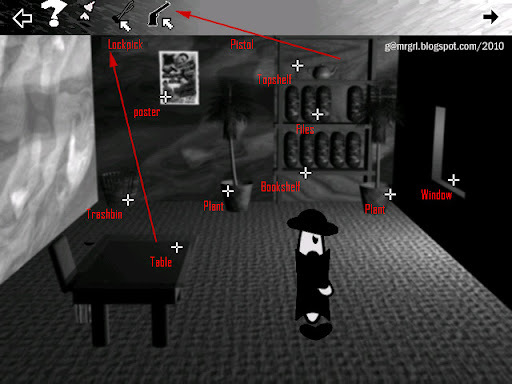 Click apartment at the bottom of the map. Keith in the the lobby of the apartment building. Click the door in the middle. It's Stillman's apartment. It's locked. Click the lockpick in the inventory. Click the door. Click the desk. It's locked. But there's no lockpick anymore! A business card is added to the inventory. If Stillman was a nightwatchman, why would he need a business card? Exit the apartment. Exit the lobby. Click the warehouse at the bottom right of the screen. 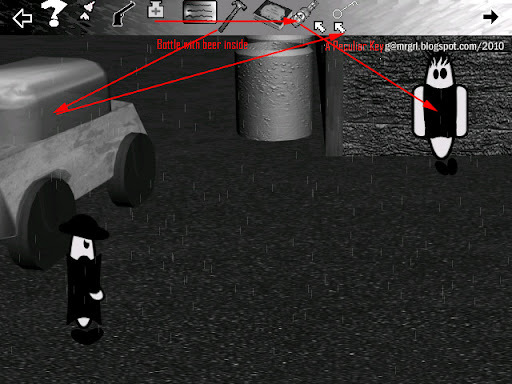 Click the trashcans at the back of the screen. The first two are empty, but another might have something of interest. 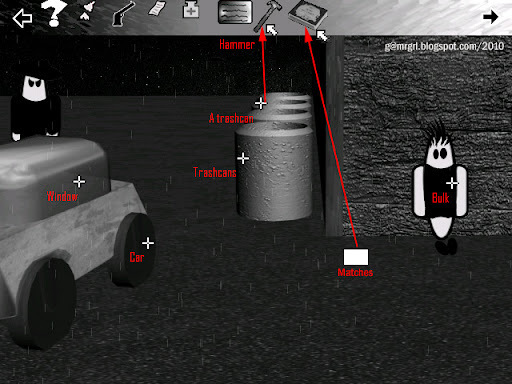 Move towards the rear of the screen to expose the third trashcan. Click the hammer in the inventory. Click the car window. Can't do it while Bulk is around. Talk to Bulk. He's thirsty and needs a drink. Try to enter the door at the right. After the fight, Bulk drops a box of matches on the ground at his right. Click the matches. They are added to the inventory. Exit the warehouse at bottom left. Return to Stillman's apartment. Click the door at the top right corner to enter the bathroom. Click the bottle in the cabinet. It is added to the inventory. The bottle is filled with shampoo. Click the bottle in the inventory. Click the sink. The bottle is now empty. Exit the bathroom. Exit the apartment. Exit the lobby. Return to Rose's. Click the bottle in the inventory. Use the matches with the note in the inventory to get burning note. Click the burning note in the inventory. Click the trashcan. Back in the bar, click the bottle in the inventory. The bottle with beer is added to the inventory. Exit the bar. Return to the warehouse. Click the bottle with beer in the inventory. Click Bulk. Click bottled ash in the inventory. Click the bottle with beer. The Knockout Cocktail is ready in the inventory. Click the Cocktail. Click Bulk. 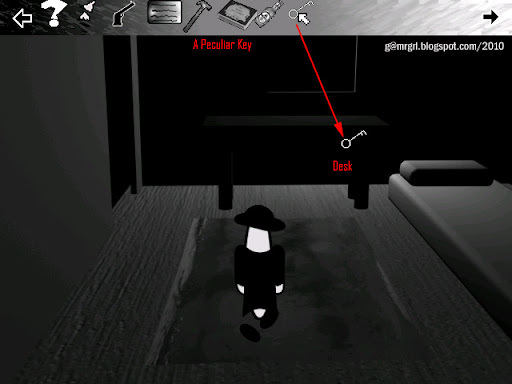 A peculiar key is added to the inventory. Exit the warehouse. Return to Stillman's apartment. Click the key in the inventory. Click the desk. Read Stillman's diary to reveal the motive behind his murder. 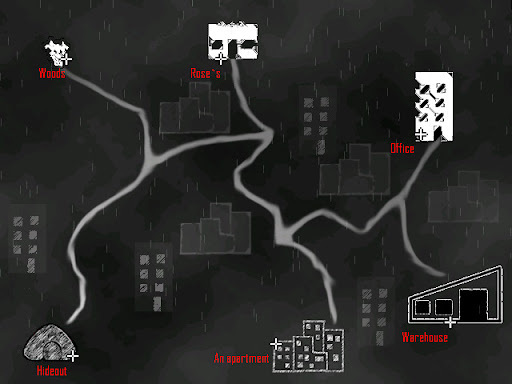 Click the hideout at the bottom left of the map. Right click on Gerald Jackson to confront him. Trade threats till Jackson challenges Keith to get proof of his crimes. Exit the cave. Return to the warehouse. Click the pistol in the inventory. Click the locked chest on top of the nailed chest at rear right. Finally, the lone bullet put to good use! Click the glass shards in the inventory. 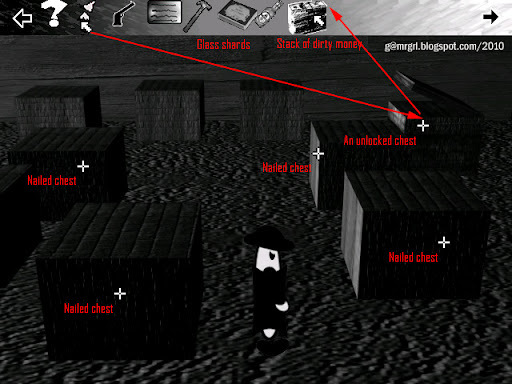 Click the tightly sealed bag inside the unlocked chest. Exit to the map. Return to the hideout. Click the money in the inventory. Click Jackson.